So a few of my siblings and I decided to trek it down to St. George with my parents for New Year's weekend. It was probably one of the best times I have had down there! From the grueling game of phase 10 we played until the wee hours of the night to the delicious breakfasts' momma cooked up each morning, to just relaxing and being with eachother. It was so much fun and I wish everyone could have been there! But there's always next year :) Thanks Mom and Dad for spoiling us all so much! 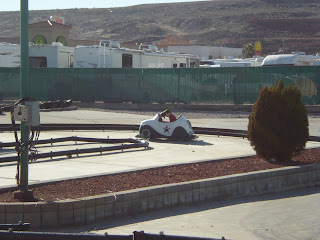 Here are some pictures from "The Fiesta Fun Center" we decided to go to one day and truly did have a fiesta! haha! Probably the best picture from the trip! Tage got pretty bummed out when the girls passed him on one of the final laps haha! This was his pose of defeat for about five minutes, it was pretty cute! 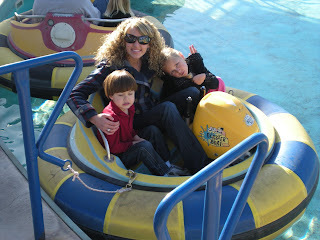 Tage, Me, and Jaycee about to go on a little water boat ride. They were so excited, can't ya tell? 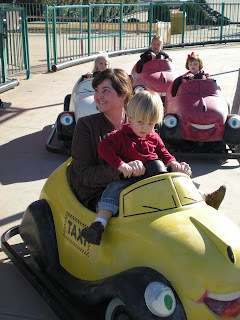 That vacation looks like a blast! 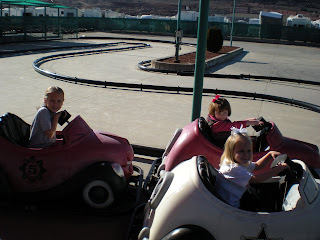 That little guy sitting out on the track is too cute...how humiliating to get passed by the GIRLS! :) You look beautiful as always!